It’s been an amazing year at KJC with many new faces added to our growing family. Our international faculty is growing every year with many musicians that come here go back to their countries and spread the word about Nepal and it’s thriving music scene. We are very grateful to the teachers that are not in Nepal anymore but are still actively working for the betterment of music education and appreciation in Nepal . This was the end of the year concert which featured performances by many of our students. It was filled with the holiday spirit, with the Christmas Market set around the stage with many gifts and souvenirs you can buy for your loved ones. 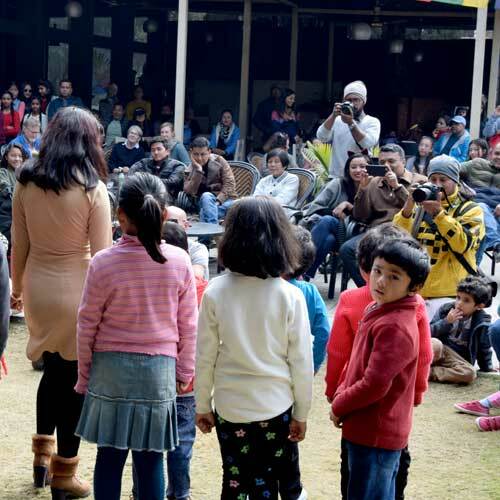 It was an open sunny day in the garden of Moksh, which is a family lounge that also doubles as a performance theatre for our school. All around the stage were cheering proud parents smiling for their kids. They were extremely cute, performing in a choir and dancing. After the kids came the adults who were learning under the tutelage of Maria Fajardo. She is a prominent figure here in Nepal and is a graduate from the world reknown Berklee College of Music in the US. She is our vocal teacher here and the choir she directs sang songs from Bulgaria. These songs had particularly dancy yet complex interesting rhythm. There was also a ticketed event scheduled after the students where the faculty and the most promising students get to perform. All the proceeds from the show are going into the KJC scholarship fund which provides for many students that want to pursue a career in music but don’t have the financial support to follow through with their ambitions. There are also many people who are differently-abled that come to learn with us for which we use money from this fund. Some of the bands that we train opened the show but the last band stole the whole show. It was a band tutored by Daahoud Salim. He is a famous international artist that plays the piano and has traveled the world through his music. This band that he trained was formed just a week ago and they played Daahoud’s compositions which he wrote exclusively for this performance. Talk about writing five songs and teaching it to a band and performing them in one week.